President Muhammadu Buhari has arrived in London for a 10-day work break, reported Channels Television. The report revealed that the president left Abuja for London in the early hours of Friday. Inspector General of Police Ibrahim Idris, CTF Minister Mohammed Bello and Chief of Staff Abba Kyari were on hand to bid him farewell. While the chair is absent, the vice-chair, Professor Yemi Osinbajo, will act as chair. 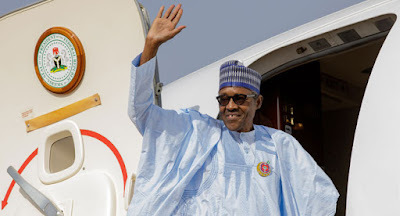 Meanwhile, the People's Democratic Party (PDP) has alleged that the president's holiday is a plot to attack the National Assembly and dismiss the Senate Speaker, Dr. Bukola Saraki and MP, Ike Ekweremadu. In a statement signed Thursday by his spokesman, Kola Ologbondiyan, the PDP said he was aware of the scheme already developed at a meeting Wednesday night between the presidency and some senators of the Congress of All Progressive (APC) minority.